SmartClean ChairMate High Chair - Slate is rated 4.0 out of 5 by 8. 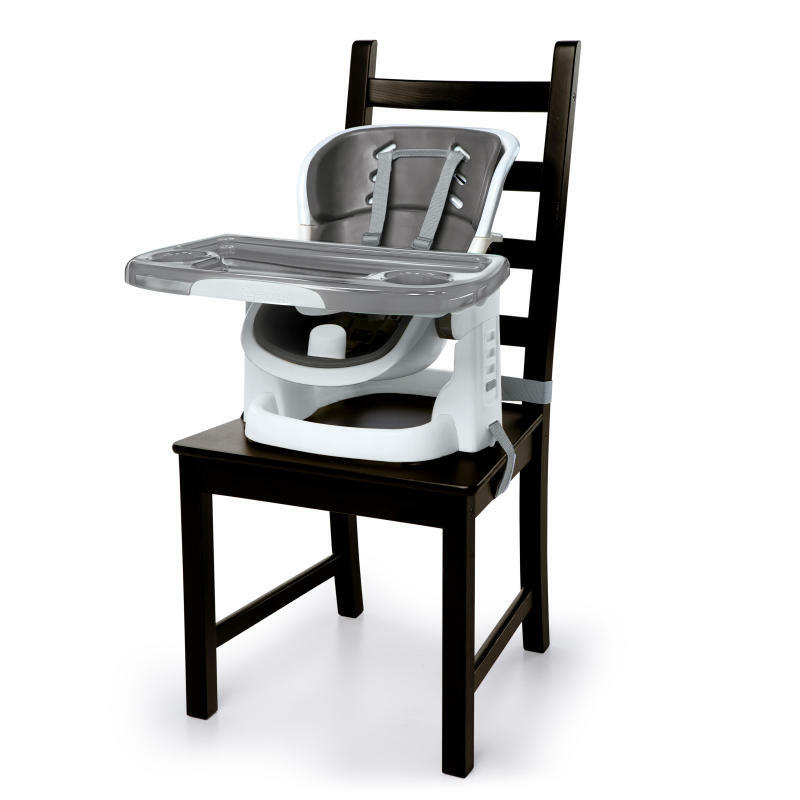 This compact portable space-saving high chair makes mealtime a breeze. Instead of moving around a bulky high chair when your baby gets hungry, this feeding chair attaches securely to most dining chairs with adjustable straps. And cleanup couldn’t be easier. The soft foam baby seat is easily removable and wipeable for cleaning. The EasyClean tray wipes clean or fits right in your dishwasher too. Even the safety straps are machine washable. Whether using at home or on-the-go, this mess-proof high chair from Ingenuity is ready for action. Rated 5 out of 5 by kuhnrod99 from Sleek design & cleans easy! I love how slim this high chair is but yet it is sturdy and secure! It's a great space saver in our small kitchen and we can easily remove it when we need the chair for an adult. I highly recommend this chair! Rated 5 out of 5 by Marcia from Love the Smartclean Chairmate Highchair I received the Ingenuity Chairmate Highchair and was anxious to try it out We have three grandchildren, age 2, 3, and 6 years who spend quite a lot of time with us. We found the highchair to be nice-looking, compact, and easy to use. Our son throws the chair in his car and brings it along to our daughter's home, for his boy. The chair served us well on Christmas Day. It wiped clean in no time, and was so much easier to handle than a big highchair. I would recommend it highly to others. Rated 4 out of 5 by katiesmith from Really like the quality of this product and how it can easily be attached to our dining room chair to be used as a high chair for our infant. Will also be great as she gets older to transition to a toddler booster seat. Also great that the padding is removable and can be washed in the dishwasher. Only negative thing to say about the product is that it is somewhat hard to adjust the height of the chair on your own--much easier with two people. Other than that a great product! Rated 4 out of 5 by katiesmith from Really like the quality o Really like the quality of this product and how it can easily be attached to our dining room chair to be used as a high chair for our infant. Will also be great as she gets older to transition to a toddler booster seat. Also great that the padding is removable and can be washed in the dishwasher. Only negative thing to say about the product is that it is somewhat hard to adjust the height of the chair on your own--much easier with two people. Other than that a great product! Rated 2 out of 5 by Elise from So many great features but one catch I so badly want to be able to write a good review for this product. I love the adjustable height, removable tray that can be washed in the dishwasher, pads that come off too and are easy to clean and overall has a smart look to it. The only catch though makes this chair almost unusable- the seat sits back too far making it impossible for baby to sit up forward enough to eat off the tray. It has adjustable reclining settings for two different positions but because it doesn’t tilt forward enough my little one gets frustrated. I don’t think this will work when we move to a booster either because he will still lean back too far. Hoping they fix this on the product for the future. Personally I prefer a one point release button for the tray instead of the two side buttons as I often am holding my little one when putting the tray on and off. Rated 2 out of 5 by Elise from So many great features but one catch I so badly want to be able to write a good review for this product. I love the adjustable height, removable tray that can be washed in the dishwasher, pads that come off too and are easy to clean and overall has a smart look to it. The only catch though makes this chair almost unusable- the seat sits back too far making it impossible for baby to sit up forward enough to eat off the tray. It has adjustable reclining settings for two different positions but because it doesn't tilt forward enough my little one gets frustrated. I don't think this will work when we move to a booster either because he will still lean back too far. Hoping they fix this on the product for the future. Personally I prefer a one point release button for the tray instead of the two side buttons as I often am holding my little one when putting the tray on and off.